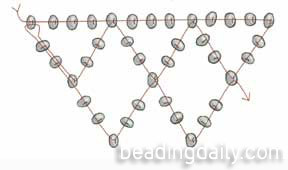 Begin by stringing a base row of 13 beads. String 5 beads and go back through the fifth bead from the end of the base row. String another 5 beads, skip 3 beads of the base row, and go back through the next. Repeat to end of row. Passing through the fifth, fourth, and third beads of those just strung, exiting from the third. Turn the work over and go back across the same way.